1. Add interest with pattern (think leopard, snakeskin, plaid, gingham…), colour (a pop of bold red if you’re feeling feisty, blush to add femininity) or shine (metallics like silver or gold). I usually wear leopard shoes or a leopard clutch when I do all black just so that there’s something a bit more to it. You can also think of wearing a coloured belt like camel (camel and black is always so so chic!) or gold to dress it up even further. You can also consider wearing a patterned scarf as a focal point, but remember not to over-do-it with the accessories you choose. 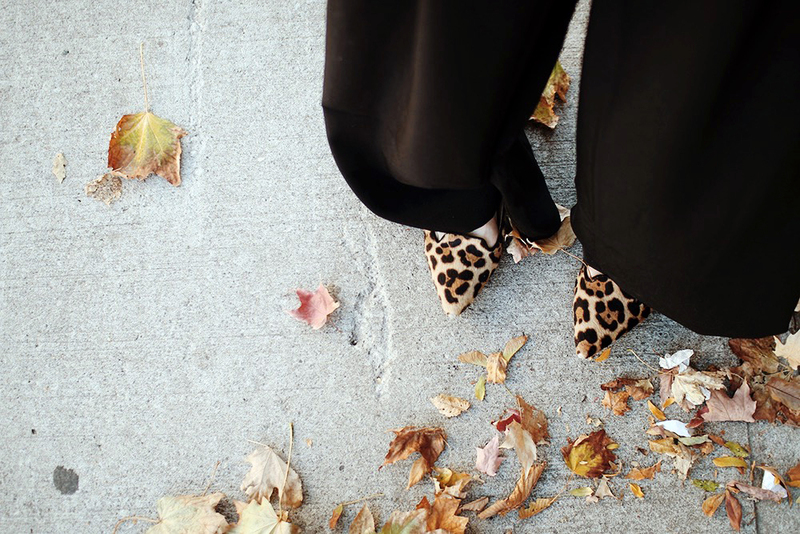 If you decide to wear a leopard scarf then keep your shoes black. The idea is to incorporate an extra touch while still keeping the look refined, so if you add too many patterns or colours the outfit becomes too busy and you loose the whole point. 2. Introduce some texture to break up the look. Here I’m wearing a worn-in leather jacket that adds some dimension. 3. Keep it simple and balance the proportions. If you’re going loose on the bottom then opt for something more form fitting on the top and vice versa.